Planning to visit NYC in December? Read on for our tips on enjoying all best Christmas sites without too much fuss. A trip to NYC in December - it feels like all those Christmas movies have come to life. Lights and decorations adorn almost every single building, and it is pretty hard not to love, even for someone like me who is not particularly Christmas crazy. If this is your first Christmas in New York City be warned, all the Christmas cheer is very enticing, and before you know it you will be singing carols on street corners with the Salvation Army carolers! If you are not used to a cold climate, New York in December can feel freezing, even at the beginning of the month. My advice - get yourself some good quality thermals and get out there exploring you will warm up in no time. Tips to see the Rockefeller tree at its best. 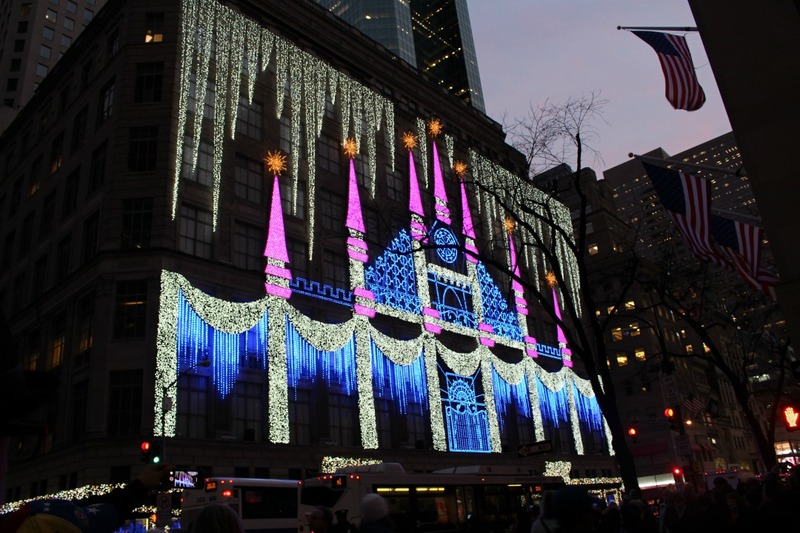 Checking out the gorgeous shop windows and lights is one of the most popular things to do on an NYC Christmas visit. If you are wondering how early they start to appear well, it seems there is no set date, but decorations begin to go up right after Thanksgiving and stay up until the end of the first week in January. We had a couple of weeks here so did not try to see all the windows in one night - we broke them into areas and visited a couple of times. If you are going to be in town Christmas Day, this is a perfect time to see them because the locals will likely be at home celebrating. 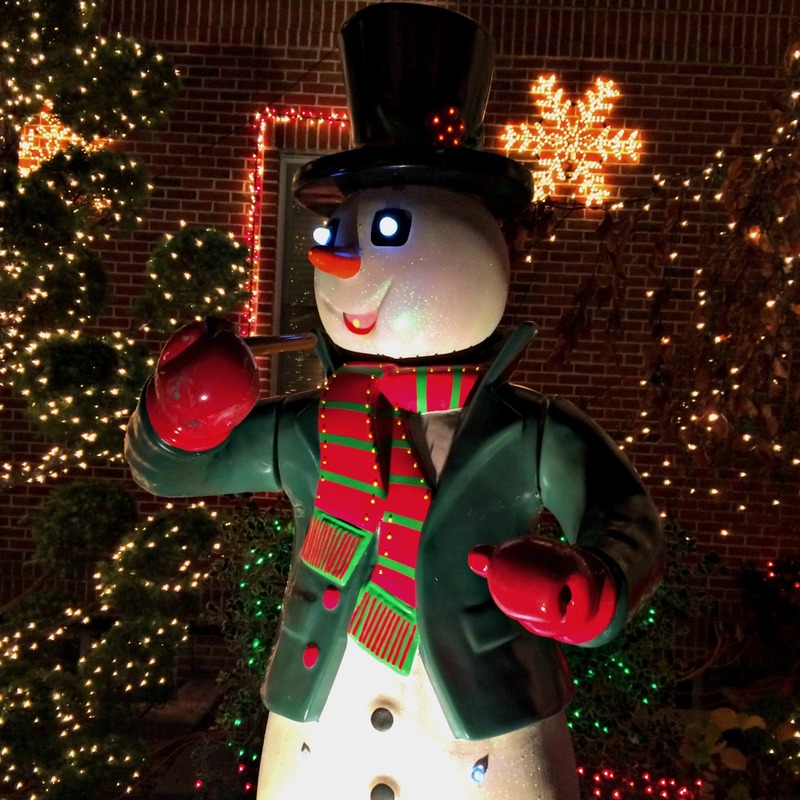 If you do not have the luxury of time, you can follow this holiday lights walking map. It will take you about 1.5-2 hours to see all the main window, depending considerably on how good you are at avoiding the temptation to shop. 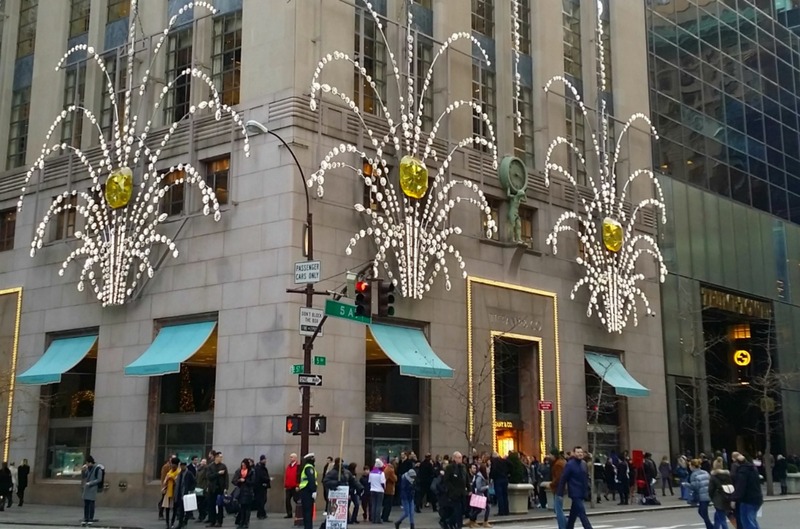 The most famous windows are along Fifth Ave between 59th Street and 34th Street. 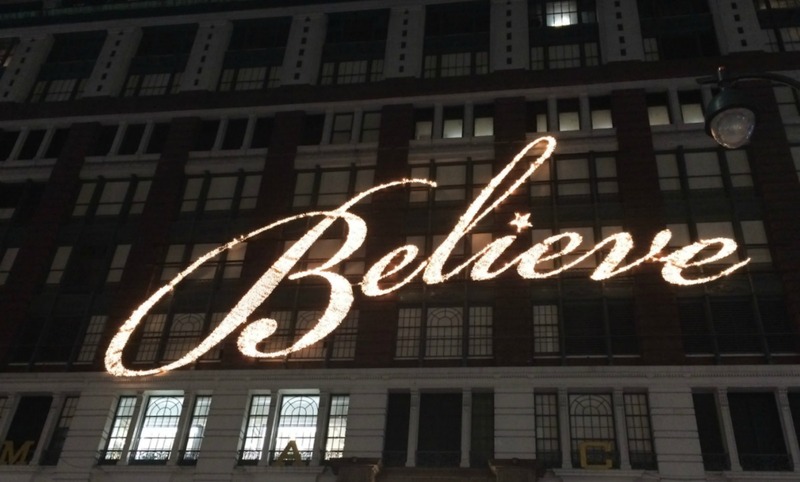 We spent our first two nights in a small hotel in Herald Square where Macy's had the simple, effective sign above. If you need to do some Christmas shopping, we found the crowds in this area were not as overwhelming and the prices more affordable than they were uptown. The Rockefeller Tree has been part of the NY Christmas tradition since 1933. Each year a large Norway Spruce tree is located in the tri-state area and transported to Midtown where it takes pride of place in New York Christmas celebrations. The tree itself appears in early November, but the 45,000 sparkling LED lights don't go on until after Thanksgiving, often midweek the first week in December. The tree then remains lit until the end of the first week in January. We were in New York from December 1st till December 12th so we knew we would get to see it. What we didn't realise when we planned the trip was that hotel room prices skyrocket around the days the lights go on. So much so that we decided to make a short trip to DC to avoid the insane increase in our hotel room price. We did not mind missing the actual lighting as the huge crowds mean getting a spot with a view is near impossible. Go at sunset or shortly after dark – This is the best time for general holiday atmosphere and good lighting for your photos. We found that the LED lights are not as bright in the daytime. Photos look great before dusk before the other bright lights in the area wash out your snaps. Alternatively, dawn provides excellent photo ops minus the crowds. Approach the tree from 5th Avenue – When you approach from this direction you arrive right in front of the tree and don’t have to fight the crowds to get to the front for a full view (and photo). It looks much more spectacular from this angle. If you have been to Rockefeller Plaza, you will know it's a pretty tight space so watching the lights come on is probably not worth the crush for anyone who does not feel comfortable in crowds. You don't have to miss out though with some planning. Try to visit early in the week and if possible after 9 pm when most of the crowds have gone for the day, the 45,000 sparkling lights are worth the effort. Even if you don't want to pull on a pair of skates something about watching happy people gliding around the ice is pretty special. Add the festive decorations and cheesy Christmas carols and it's hard to resist sitting for a while and taking it all in. Bryant Park Ice rink us right by the markets making it a great spot to spend a few hours. 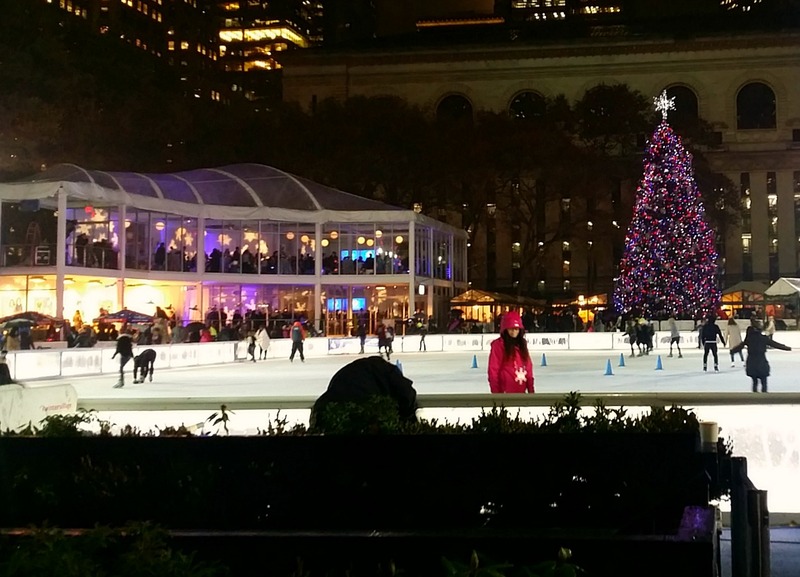 Along with the best-known rink at the Rockefeller Center, there are several rinks around the city including Bryant Park, two in Central Park and an indoor option at Chelsea Pier. 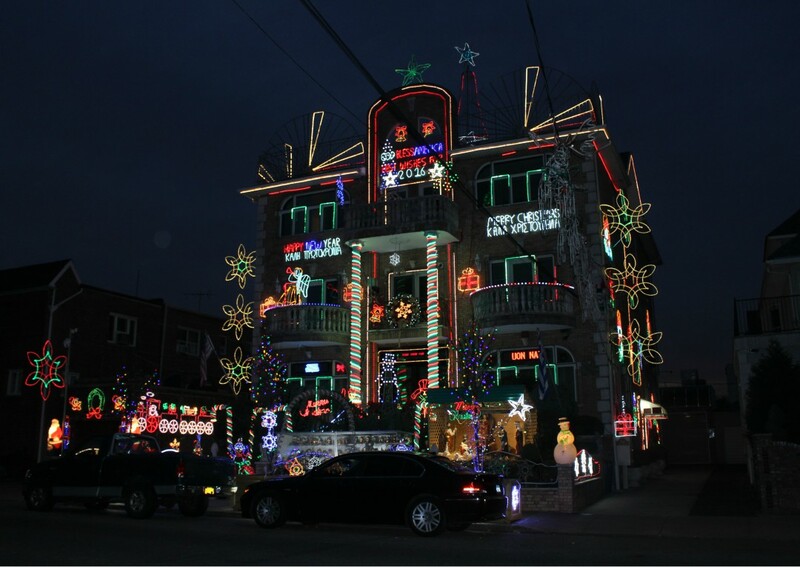 Some very serious effort and I imagine money, goes into Christmas decorations in this city, and the homes of Brooklyn are no exception. 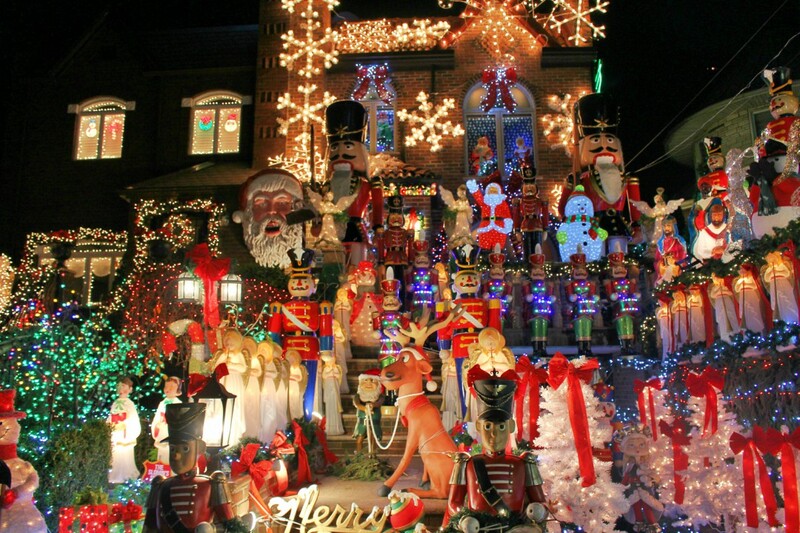 One area that is well worth going out of your way to visit is Dyker Heights in outer Brooklyn. Since the mid-1980s the homeowners here have been decorating their homes and gardens to celebrate the season, and these days some families spend more than $30,000 to do so! We hadn't realised what big business this was until we noticed several companies advertising their Christmas light installation services in the front yards of several homes. While lots of people in our hometown of Sydney at home in Sydney decorate their houses for Xmas, it's very much a DIY style thing. These lights are seriously impressive! The main concentration of lights begins at 11th Avenue and continues to 13th Avenue mostly between 81st and 84th Street. Although according to our guide it seems to be spreading farther each year. From the tasteful to the totally over the top, it's all here. Make sure you don't miss the Sparta house at 1152 84th street which is apparently where the tradition began in 1984. Then just across the road is the famous Toyland theme at the Polizzotto house (above). The tall red soldiers were among my favourite displays. You will find this one at 1145 84th Street. Another house that always gets a mention is Sam the Greek's place (below) - near the corner of 71st Street and 14th Avenue was the first one we came to and quite a walk from the others. This house is very much a homemade job with lots of cables on show, but it's a local favourite. Several companies offer tours to see the outer suburbs take in some of the finest examples. We were lucky enough to be shown them by our Big Apple Greeter, but I think it would be easy enough to do it yourself. We took the D train to 71st Street, and from here it was about a 20-minute walk to the main action. We walked a loop and got a bus from 7th Avenue to the 18th Ave station to take the train back to Manhattan. It's a bit of a journey but using the subway, wandering the streets of Bensonhurst and Dyker Heights is an excellent way to see another side of the city. We finished up at a local Pizza place by the station and had a great super cheap meal. 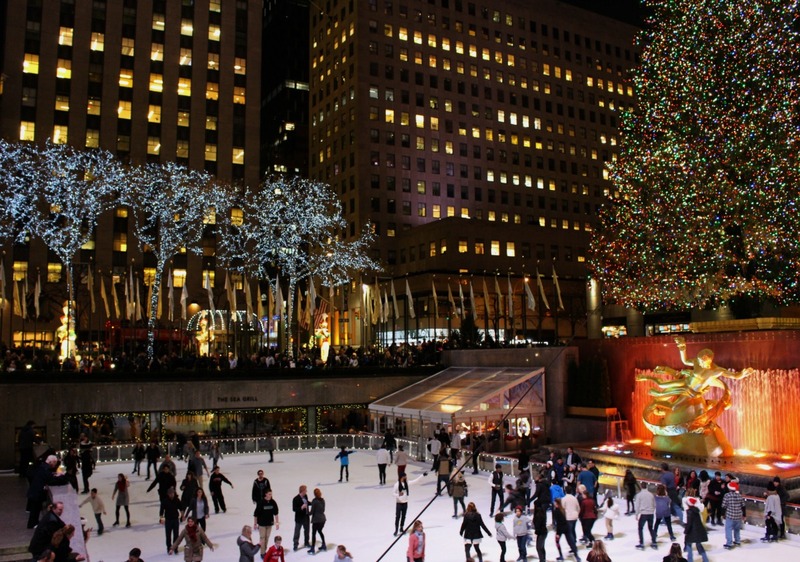 You can also take a public transport Free Tours by Foot of the Dyker Heights lights or a more bus tour to Dyker Heights that that includes a skate on the Rockerfeller rink. Another important part of a Christmas visit to New York is visiting out some of the holiday markets. There are quite a few to check out. We managed to visit several on our 10-day visit. Even if you are arriving earlier in the season, you won't miss out with some markets opening at the beginning of November. Most continue after Christmas until the new year. 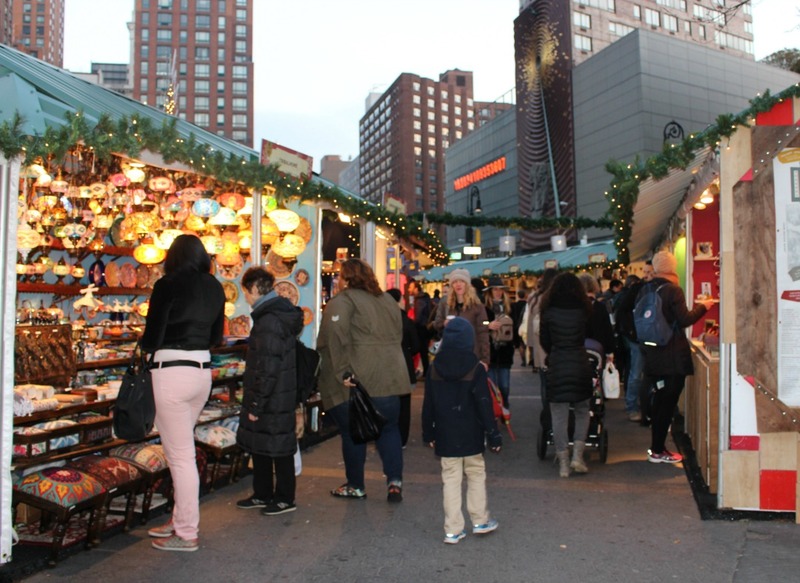 We started on our first evening by heading to the Bryant Park Winter Village. The market had over 100 vendors, most in glass booths rather than outdoor stalls which was much appreciated on this rainy night. 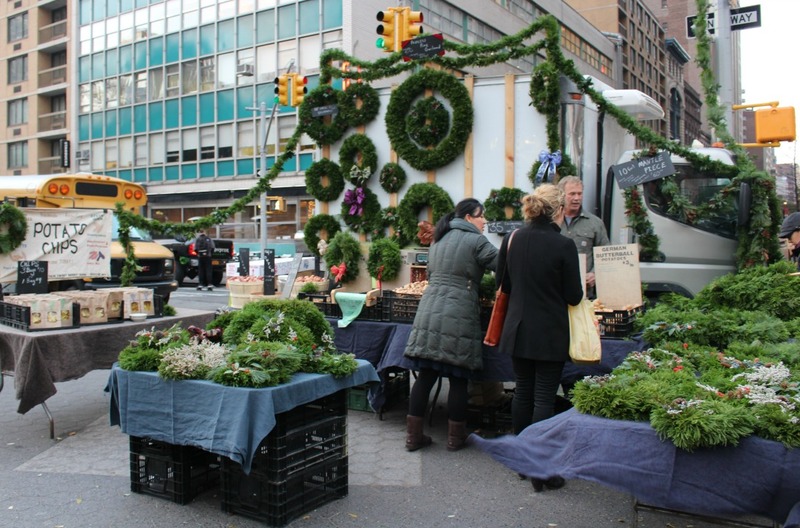 This market opens at the end of October so ideal for those visiting before Thanksgiving. For days when you just can't face the weather, there is an indoor market at Grand Central Station. This one was kind of upmarket and while it seemed quite small to look at there were 75 or so vendors. Lots of artisan products here, making this is a great spot to pick up something unique. Last year it started mid-November and finished Christmas Eve. The final market we made it to and my favourite was the Union Square; it was also the largest we visited with over 150 stalls and had something for every budget. I felt like I could do all my Christmas shopping here quite quickly. Markets we had hoped to check out but missed were Columbus Circle near the entrance to Central Park and the Brooklyn Flea Holiday market which was only on weekends. If you are travelling alone or prefer an organised tour to help you find all the markets between Columbus Circle and Union Square this walking tour is good value. If all this shopping starts to make you hungry then you might want to check out this list by local New Yorker Kelly of the best of the New York Brunch scene. 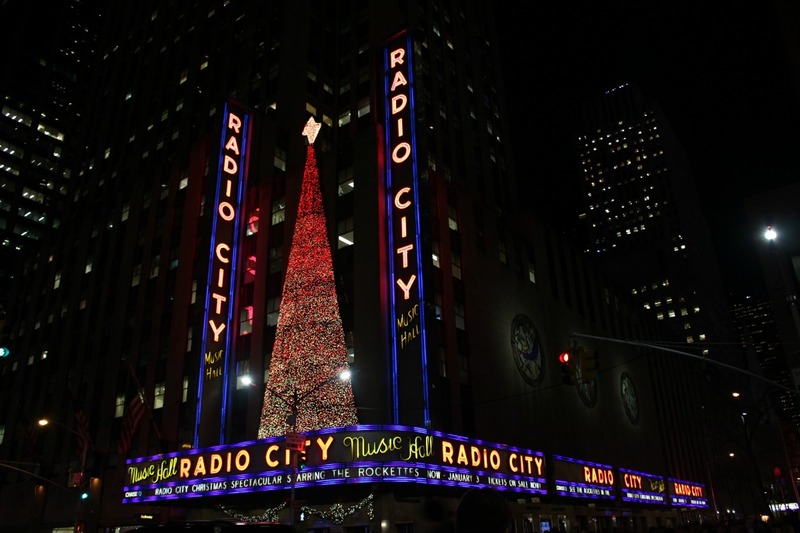 Another NYC Christmas tradition that dates back over 75 years is the Radio City Music Hall, Rockettes Show. 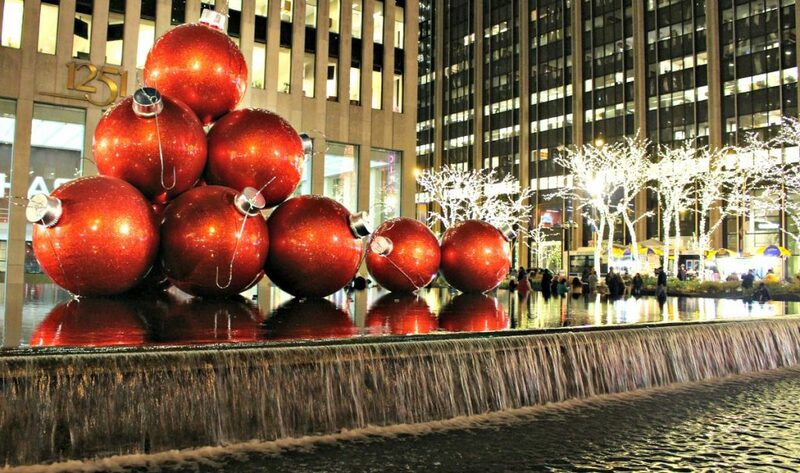 Like the Rockefeller tree, this tradition began in 1933. In those days it was just a 30-minute performance, now the show runs for 90 mins and seems to be loved by most who go along. Tickets start at $ 41 but you can often find half-price tickets available from the various ticket booths around the city. 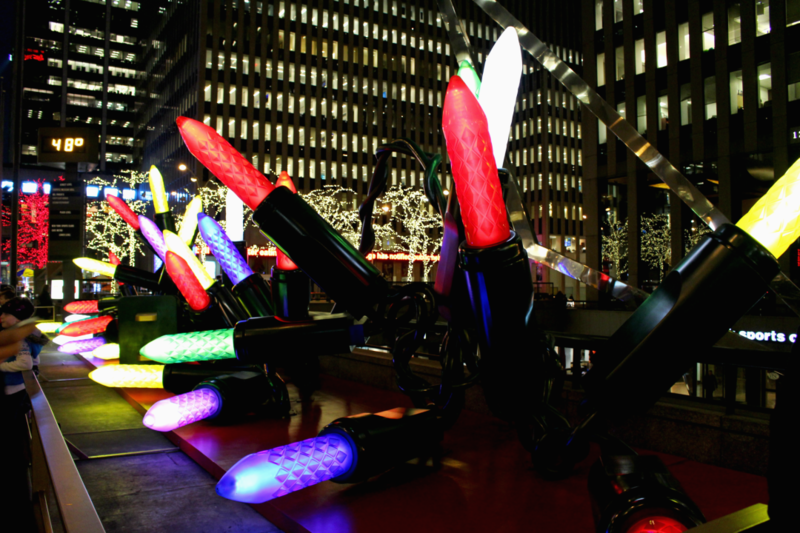 We decided against Rockettes, firstly it just did not grab us, we wondered if it would be too cheesy. Also travelling in as a family of 4 means you need to limit the big-ticket events, and we found there was enough to keep us busy just out on the streets. I loved how pretty Radio City looked all lit up, in fact, this block was my favourite in the entire city. Just across the road were these oversized Christmas baubles and several Salvation Army collectors singing carols and playing bells. It was all rather magical so make sure you don't miss this part of town. I really wish we could have had even more time. We would have liked to have attended the Harlem Gospel Christmas Concert but it is only on the days right before Christmas. Hotel rooms in New York are always pricey but in December they get even more ridiculous. Our trip was from the 1st to the 14th, and I started looking for rooms for our family of 4 about five months out and found prices just kept going up. There is a real surge around the first weekend when they light the Rockefeller Tree - we could not move our dates completely, so we decided to pop down to DC for a couple of days. The hotel savings almost covered the 3-day break for our family of 4. We stayed at The Leon Hotel and it suited what we needed perfectly. They have family rooms which have 2 queen beds in the main room with a bathroom and then a separate room with another queen bed and en-suite. Have you been to New York in December? Why not share a tip?